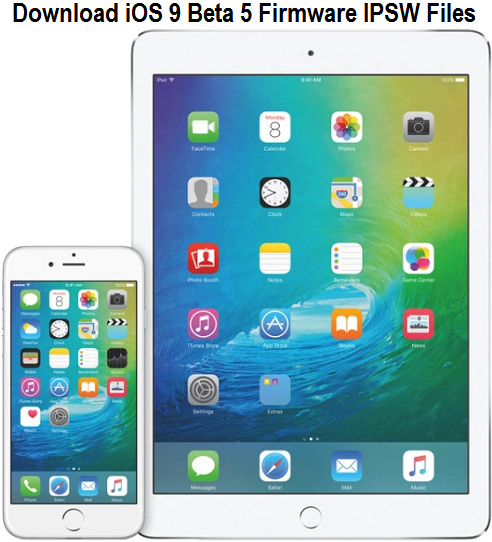 The latest official iOS 9 Beta 5 Firmware (Build: 13A4325c), Xcode 7 Beta 5 Software (Build: 7A176x), WatchOS 2 Beta 5 Configuration Profile (Build: 13S5325c), Apple Configurator 2 Beta 5 and iOS 9 Public Beta 3 Updates for iPhone, iPad and iPod Touch is available by Apple for iOS developers and non-developers (general public users). Download iOS 9 Beta 5 .IPSW Files via Direct Links for Manual Installation Using iTunes now. 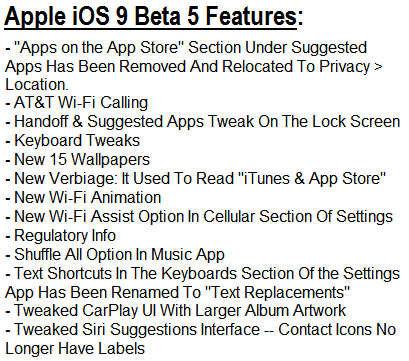 You can read full iOS 9 Beta 5 Changelog brought by Apple in below image, and you can also watch iOS 9 Beta 5 video review. Below is the full Changelog of WatchOS 2 Beta 5 by Apple. Untethered iOS 9 Beta 5 Jailbreak using PP or TaiG iOS 9 Jailbreak Tool is not possible. How to Manually Install iOS 9 Beta 5 without UDID? Get iOS 9 Beta 5 OTA Update (over-the-air) by simply going to Settings > General > Software Update option. Apple iOS developers can visit iOS Dev Center website, and iOS non-developers can free activate iOS 9 Beta 5 without developer account by getting .IPSW files from below available links.